Transitional House Plans are a sophisticated blend of Contemporary and Traditional, or classic, home design styles and may sometimes be thought of as empty nester home plans because of some of the features common in the style (more on this later). When you think of an architectural style like Farmhouse or Colonial, you may envision a somewhat staid appearance, with cedar shake or horizontal lap siding, asphalt shingle or slate tile roof, and conservative treatment of roof lines – with perhaps dormers as the most extravegant treatment. But if you instead throw in vertical and or angled wood siding, a metal roof, and varied roof lines, you suddenly have a more contemporary take on the traditional design – Transitional style. 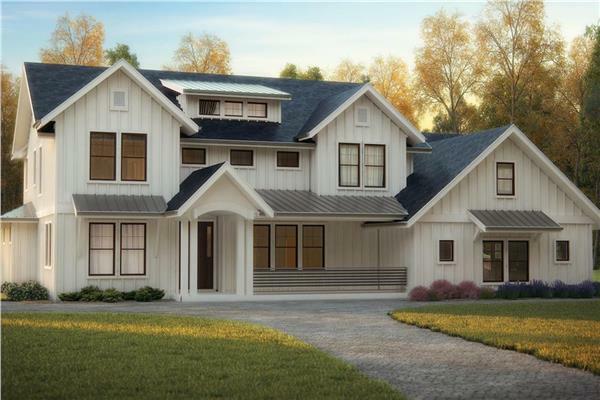 There are several categories on our site that describe certain types of home plans that aren't necessarily architectural styles but deserve to be set apart in a category of their own. Some of these include, cabins, vacation homes, Feng Shui designed homes, and as we will explain as you read further, transitional style homes. The plans that we have in the Transitional House Plans category not only have a mix of Contemporary and Traditional design aesthetics but are home plans that have been popular for couples in transtion, having raised their children and are now living alone (together – but without kids). A Transitional style floor plan often has an open floor plan (more contemporary than traditional), fewer bedrooms, and larger spaces, spoiling the parents for their hard work raising children or providing the retiree plenty of room for his or her hobbies. But they also suit the family "transitioning" from young to mature – no more babies and toddlers running around but teenagers and young adults who can blend into the family dynamic through the pared-down floor plan. Browse through our Transitional House Plans category, and you'll find home plans of all types of styles. Keep your eyes open for more modern looks and more contemporary floor-plan treatments, plus elements that maintain a tie to the main style represented. And don't worry, if you're young and fall in love with one of these house plans, just remember that they are smartly designed to be "forever homes."